The sight of regular self defense devices let others know that you mean business. This means they act as both a deterrent and an effective defense mechanism. The downside is that they also show a would be attacker what you are going to reach for should they try and take advantage of you, and the last thing you want is to be disarmed and have your stun gun or pepper spray working against you. Here is where covert self defense items can help. Because covert stun guns and protection sprays look like everyday items, they give you the advantage of surprise when confronted with an aggressor When something like this happens to you, every single advantage could be the difference between a close call and a traumatically life altering event. Lastly, you still get a deterrent factor from covert self defense devices. Even though a perpetrator can’t see that you are holding a very powerful self defense device, you still know that you are. This means that your “would be” attacker will see the aura of your confidence, and this alone may be enough to deter a crime. So What types of covert defense are there? These types of stun guns are not only the most popular, they are often some of the most powerful as well. The two big names here are the Pretender and the Immobilizer. The Pretender is a Stun Master stun gun and is manufactured by Safety Technology. The Immobilizer is a Streetwise Security model that is made by Cutting Edge Products. Both offer huge take down power after just seconds of contact. Both have a lifetime warranty and included holster. Its very common to see someone with a cell phone in their hand, which is why a lot of people choose to carry this type of covert stun gun. These covert self defense devices are something out of a James Bond Film. Similar in design and application, both the lip stick stun gun by Safety Technology and Perfume Stun Gun from Streetwise Security can send someone to the ground twitching like they just got bit by a black widow spider. Made with the protection of women in mind, these covert self defense devices are also small enough to be completely concealed in the palm of a woman’s hand and can implemented with ease in a close up confrontation. Similar to the lipstick and perfume stun guns except instead of a shock of electricity, these shoot out a burst of capsicum pepper. Although pepper spray can be slightly more difficult to use, (see our article on how to effectively use pepper spray) it can be just as effective in subduing an attacker when used properly. These covert gadgets have a storage compartment for things like keys and valuables inside two 1lb jogging weights. More importantly however is that it carries a replaceable Pepper Spray Bannister This means that if you were to get attacked while out jogging, you’ll be prepared and your attacker wont be. This pen really is mightier than the sword! Disguised as a piece of normal looking stationer, the pepper pen packages a powerful delivery system of pepper spray that contains 5 one second bursts that spray a stream of up to 6 feet! 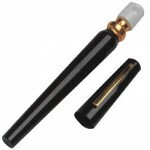 The pepper spray pen also easily attaches to a pocket for easy draw action. This gadget produces an almost blinding light with a simultaneous 90+ decibel alarm. The sight and sound of this covert self defense device will not only help frighten off an attacker, but will also draw attention and help bring others to your aid. The best part is that the attack DVR also records the entire event, capturing both audio and video that can be used in later for both apprehending the criminal and providing proof to aid in their conviction. Its a two in one threat. First, it functions as a Kuboton (a much more effective hand weapon than just carrying your car keys between your fingers). Kubotons are used on the bony surfaces, soft tissue, or nerve points of an attacker. There is really no wrong way to use the Kuboton. Your striking power is enhanced with every blow causing increased pain to your attacker. You can even hold the Kuboton with key attached to the key ring and swing them in your opponents face. Of course, as effective as a kuboton is, this model does one better. The Mace Kubotons carry 3 refillable one second bursts of pepper spray that can immobilize an aggressive person from 5 feet away. Although pepper spray has some restrictions, a kuboton can be carried with you anywhere. So even if you don’t get the kind with the covert pepper spray, they are worth looking into. The element of surprise is one of the biggest advantages in combat. Covert self defense devices provide you with this devastating advantage over an attacker. Not only that, but the confidence of your empowerment is often enough to prevent you from being victimized in the first place. Visit StunGunMikes.com and check out our section on Covert Self Defense. You’ll be glad you did. Being mugged can be a horrible and terrifying experience. Muggers victimize innocent people who they feel will not be a threat. This is usually perpetrated on side streets, in dark alleys or empty sidewalks. Victims of mugging commonly experience some form of shock after the incident. Even though police perform round the clock patrolling, they cannot be in every place all the time. The best defense against being mugged is being aware of your surroundings. When walking alone, try to dress casually without any flashy jewelry. Muggers can spot victims carrying valuables with them. Walking with headphones and listening to music may also entice a mugger to take you by surprise. As well, it is always best to choose a path near curbs and facing traffic. That way, you have strategic position that allows you to see what is on all sides, and prevents someone from trolling beside you in a car. Mugging is less likely to happen when many people are around. Choose routes that are well populated with good lighting. When going to a new place, its always good to map out the way beforehand. A Person who appears lost appears as a target. Walk briskly and appear to be with a purpose in order to intimidate attackers. Whenever possible, travel with a group of people. Mugging can happen to anybody, at any place. You should always be prepared in the event of an attack. When sensing that someone is following, head immediately towards a crowded area. Make noise to attract attention. Be ready to defend self by applying any skills or self-defense training, and have your person self defense weapons ready to disable assailant such as stun gun or pepper spray. There are reliable stun guns available on the market today such as the Stun Master stun gun. Stun Master stun guns have passed extensive testing. They are among the most reliable and trusted for self-defense. Stunmaster stun guns do not carry enough amperage to be lethal, but they transmit enough voltage to incapacitate even the largest assailants, without inflicting any permanent damage on them. Stun guns operate by discarding electrical charges into the nervous system. The nervous system, which has its own electrical signals, becomes confused disorienting the attacker. When the stun gun is applied for a second or more, it will create disabling muscle spasms. The longer the application the more imbalance and disorientation. The stun gun has physiological effect on a person, but does not inflict any long-term damage; making it safer than regular firearms. Criminality is part of society, and safety is a personal responsibility. In order not to be a victim of mugging, people should take all the necessary safety measures of avoidance. When attacked is imminent, apply all the practical means of self-defense and be ready with a personal pepper spray or stun gun. A cell phone stun gun works great because it looks entirely normal when you are carrying it in your hand. Concealed carry or CCW is the term for carrying a concealed weapon, defensive or otherwise. Technically speaking, Mace, pepper spray, stun guns, tasers, kubatons, and even pen knives can fit into this category. Each weapon has its own set of restrictions and they vary from state to state. For instance, it may be legal to own a gun in one state but not a stun gun. Alternatively, it may legal to own a gun in some states, but not to carry it within certain city limits withing the state. 48 of the 50 states have passed laws to allow citizens to carry certain concealed firearms, in some cases without a permit. No issue means exactly what it says. The state does not issue or recognize concealed carry permits. Illinois and Wisconsin are both No-Issue jurisdictions. This is important to know if you are traveling between states in the U.S.
May Issue means a permit is required to carry a concealed handgun. In some states like Alabama it may be very easy for a civillian to get a ccw permit, while in other may-issue states like New York and New Jersey is may be next to impossible. Shall Issue means the granting authority has no discretion in the awarding of the permits once the ccw permit criteria is met. CCW permit requirements may include residency, minimum age, background checks, training requirements, and paying a fee. The shall issue ccw requirements vary greatly from state to state. Iowa will also be included January 2011. Unrestricted is a jurisdiction in which no CCW permit is required. Only Alaska, Vermont, and Arizona fall under the unrestricted concealed carry category. It has been proven time and time again that people who purchase and “learn to use” self defense products stand a much better chance of stopping an assault to escape and summon help. We all have a natural tendency to trust our surroundings, but more and more of us are starting to realize that we must be “street conscious” and assume responsibility for our own safety and well being. Kubaton Key chains, Pepper Spray, and Stun Guns disguised as anything from a cell phones to a tube of lipstick can all protect us if we are willing to put in the time to learn their proper use. Most Stun guns like the small fry now come with some sort of disable pin to prevent the device from being used against the victim, where as most self defense sprays don’t really come with a manual or anything that prevents them from being used on the victim. Defense sprays owe a lot of their popularity to the fact that they are light weight, small in size, and require no long term special training for successful use. Their range is good enough to keep an attacker away from us, and their use causes no permanent harm. Self defense classes certainly have their place, but in the real world when danger strikes, things don’t always go as planned since our minds are no longer in the logical thinking mode that they are in when we are learning a martial art, panic can render a lot of self defense moves ineffective. Techniques for Pepper Spray, or Mace products can be learned easily and require only minimal practice for maximum efficiency. Spending a few minutes to learn the proper self defense techniques and tactics of these products can save you years of agony recovering from an assault and may even save your life or the lives of your loved ones. Defense Sprays are one of those things we learn how to use in the hope that we never have to implement our training. This Buying Guide is about choosing the right pepper spray, so that will be our area of focus. There are 3 main chemical compositions of pepper sprays, each with different effectiveness ratings. OC is the newest of the 3, and by far the most effective. This is the only one you should consider using for your personal safety. CS (Orthochlorobenzalmolonitrile) and CN (Alphachlorocaetaphonone) work by irritating the membrane tissue. This causes a stinging pain and eye watering reaction (tearing). This reaction may take from 5 – 30 seconds to manifest, which is a long time when you are confronted with a life threatening situation. If your attacker is drunk, delusional, or on drugs, there may be no effect at all. This is where stun devices had a previous advantage. Police have complained about these sprays for years that CS and CN pepper sprays are too unreliable, and this is one of the main reasons why the introduction of OC based pepper sprays has led to an increase in officer and civilian safety. Unlike CN and CS, OR is not an irritant. It acts as an inflammatory agent, giving it a huge advantage over other sprays. As you can see, OC pepper sprays can be just as effective as stun guns in stopping an attack. The American Security Institute recommends a defense spray containing OC in any formulation and concentration over a CN or CS based spray for self defense by both law enforcement and civilians. Pepper Spray generally comes in a sizes ranging from1/2 an ounce to 4 ounces. Small units can be safely attached to your kubaton key chain, while medium size 2 oz versions can be carried in a purse or on your belt clip. The length of time the pepper spray will fire for. To be effective, a mace of pepper spray canister need to fire a distance of 6-8 feet (the range most physical assaults take place). The number of shots is not critical as a good 1-2 second burst is usually enough to disable an assailant. This make the smaller versions a lot more practical. Much More important than a pepper sprays capacity is its spray pattern or “nozzle” This determines dispersal density of the pepper spray and allows us the choice of a direct stream to the attackers face (requires aim but gives more distance) or a cone mist which has a shorter range but is easier in panic situations. The cone mist versions of pepper spray mean that it is possible for the mist to be blown back into the sprayer face if there is a strong wind. However, the stream shot may not be fully inhaled by the attacker. Either way, when making your decision it is important that we realize we must hit the attacker’s face area for true pepper spray effectiveness. Pepper spray or mace usually comes in concentrations of 1%, 5%, and 10% (10% is usually limited to law enforcement) The formulation effectiveness may vary from brand to brand. Some 1% versions may carry a greater efficacy than that of a 10%, it just depends. Generally a 5% concentration with a cone mist is the safest choice. Attaching the small pepper spray unit to a kubaton keychain is effective for when out and about, while a large fogger type is good for at home beside the door. Everyone should have some sort of plan for their own safety should they be attacked. This may include martial arts or self defense training, self defense product tactics and the efficacy to implement these tactics in emotionally challenging situations. Believing you are safe during the day and only carrying your stungun, or pepper spray at night may be a crucial mistake. In today’s world a violent crime gets committed every 17 seconds. Carrying a defense spray or taser is simple common sense. On your Belt . If you are going to wear your defense spray on your belt, it is a good idea to attach it upside down. This makes the pepper spray or mace easier to draw. If you are using a holster for your pepper spray, make sure it is in the correct positioning so that you don’t have to rearrange it before shooting it. You should practice drawing it and aiming it until it feels natural. Bruce Lee found that the best training was to actually imagine the attacker, and the emotions you would be experiencing, in a real situation. By treating every practice drill as if it was real, you empower yourself for the time when it is. For women, one of the most favored places to carry pepper spray is their purse. If you choose this method it is important that you don’t just throw it in there. Make sure that it is easily accessible or you may find your purse stolen before you can retrieve your defense spray. 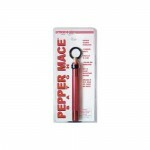 The best way to carry mace or pepper spray in your purse is to clip it to an inside pocket, flap, or divider. Arrange it so that you can walk with your hand in your purse allowing you to draw your pepper spray quickly. A long strap slug over your shoulder is ideal and could potentially cause an assailant to hesitate if they see you with your hand in your purse. When you do practice drills, treat them as if they were real life life situations. Your focus should be on maintaining control of the pepper spray, not your purse. This could be the difference between becoming a victim and surviving a hostile confrontation. You need to trust you instincts while remaining in control of your emotions. A preemptive strike is very close to assault. If you are unsure the best thing to do is avoid the situation. People generally prefer their own personal space. If someone is giving up this personal space in order to be closer to you, this may be a warning sign. For example. We are completely fine with standing 6 inches away from someone in a crowded elevator, but someone 6 inches away in an otherwise empty elevator should definitely set off some warning bells. When being verbally harassed in the form of demands or threats it is completely justified to draw and use your pepper spray. This isn’t to say that if someone is angry at you for cutting them off in traffic that you have the right to pepper spray them, but it is saying that if they are threatening to enforce their will upon you that you have the right to defend yourself. If the physical barrier is crossed at anytime you need to keep your head and deploy your self preservation and defense strategies. This calls for immediate and decisive action. Make sure you keep up your practice sessions as describe below. One of the keys to effective use of pepper sprays is timing. The most important thing is to have the spray easily available and ready. Next is you need to learn to use it quickly and accurately. It is important to know the difference between threatening someone with your pepper spray and holding it in hand for ready use. If you threaten someone with your mace or pepper spray before you are ready to use it, they may escalate the situation by pulling their own weapon. As well, this takes away your advantage of surprise. It is important not to raise, point and shoot the pepper spray until you are ready to shoot. This means the attacker must be within range. (i.e. you can hit them in the face.) The idea is that you incapacitate the attacker before they have a chance to think. When you are ready to fire your mace or pepper spray you should go into a slight crouching position with your weight evenly balanced on both feet. Thrust your non-shooting hand forward and yell “STOP” at the attacker. Then raise your shooting hand and spray the attacker directly in the face. Yelling stop creates a slight diversion and focuses your energy. As well it causes the attacker to focus on the hand without the pepper spray. Never thrust your shooting hand at an attacker as they may be able to knock it away or disarm you. Instead, fire your pepper spray while slowly backing away from the assailant. As well, do not close your eyes, you may have to correct your aim even with a wide range firing pepper spray. Fire the spray for 2-3 seconds for a good solid hit around the head and shoulders area. Once the assailant is experiencing coughing spasms concentrate on getting away and calling help. If you are facing multiple attackers you should concentrate on using a circular or semi circular spray pattern as a protective barrier. It is usually a good idea to go for the closest attacker first as it may cause the others to retreat. If they do not retreat you must fight the urge to run. Spray a 180 degree arc in front of you and continue backing up. This defense works best at 6-8 feet. If however your attacker’s are attacking you at a run from any sort of distance, your first reaction to run is probably the best one. While running, pull the pepper spray out and aim it behind you and shoot. This is only effective if they are 8-10 feet behind you, otherwise you are just wasting your pepper spray. If you find yourself being held in such a way that you cant escape, fight to free your shooting hand and while holding your breath, fire your pepper spray in a fog that surrounds the both of you. This may make the attacker let go long enough for you to refocus the spray directly at them while retreating. Unlike you, he will not be holding his breath. If you find yourself being attacked in a car, firing your pepper spray will fill the space instantly. You must get out of the car. If you use your mace or pepper spray in your own car, make sure you roll down your windows and only drive away if absolutely necessary. If the attacker has a gun, it is imperative that you do not pull out your pepper spray as this may cause the attacker to shoot you. If you are facing an assailant with a knife do not let them get within arms length. The moment you see a knife, back away while spraying your mace or defense spray. NEVER TURN YOUR BACK ON AN ASSAILANT WEILDING A KNIFE. You must remain aware of how far the knife is at all times in order to protect yourself adequately. If you are surprised from behind don’t spray in a panic. Do not use your pepper spray until you know if there is a weapon involved. Anytime you are close to an attacker with a weapon it is always better to get far enough away so that the weapon cannot harm you. You should test your pepper spray unit once per month. Spray it outside, downwind for a brief spurt then release. 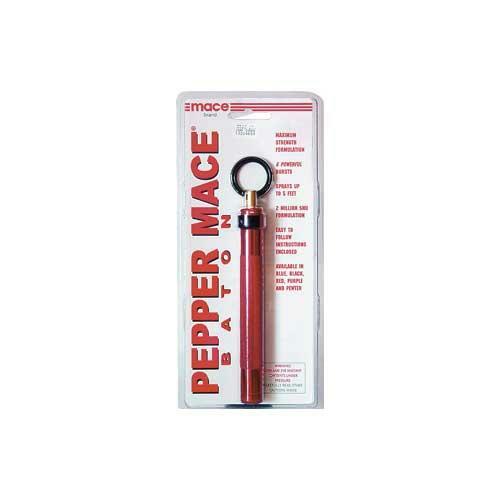 If the mace or pepper spray’s range is less that 3 – 4 feet, or the pepper spray seems weak or thin, replace it immediately. Mace and pepper spray canisters are like fire extinguishers in that over time they lose their pressure. Pepper Spray is best kept near the main entrances to the home. It is better to keep them out of sight high on a closet shelf or potentially attached to the wall or door frame. If there is an intruder in your home your focus should be to create a spray barrier outside a lockable safe room where you and your family can take refuge. Do not attempt to open the door, pepper spray the intruder and then close the door suddenly. If you do not have a “safe room” it may be better to wait for the intruder to come through the door before pepper spraying them in the face. This gives you the element of surprise, which is a large tactical advantage. If the intruder is entering in through a window or door, or they are within 6 feet, you should employ your pepper spray as if you were being attacked on the street. Do not turn on the lights if the intrusion occurs during the night unless they are still outside. If they are outside, the lights may scare them away, which is always better than a face to face encounter. The large fogger type pepper spray or mace usually has a range of 15 – 20 feet, and is generally considered the most effective type of residential defense spray to buy. Remember, there is a difference between carrying a defensive weapon like mace, tasers, or a stungun, and knowing how to use these items effectively in life threatening situations. Buy your Pepper Spray, Mace, and Taser products at Stun Gun Mike’s Home Security and Self Defense Superstore Now!